North Coast Caravans Ltd. - Bude Cornwall - Caravan Servicing. We strongly advise that caravans are serviced regularly, for peace of mind and to secure your investment. As a trusted dealer with an independently assessed 'Approved Workshop'. 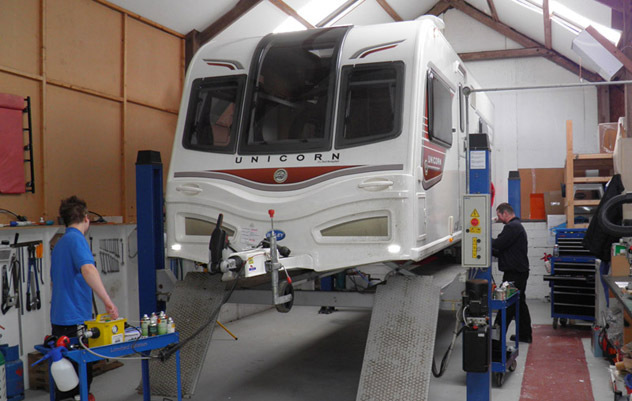 You can feel confident that all safety checks have been strictly adhered to, as our qualified and certified engineers are fully trained and authorised to service all aspects of your caravan to the highest of standards. All Grease and Lubricants plus other small sundries. Touring caravans need regular servicing, even if standing next to your house for most of the year, as tyres can perish and other problems develop. Manufacturer’s warranties also require servicing to be done on a new caravan at regular intervals. Included in our annual service is a 'damp survey' to help identify any early signs of water ingress, and if caught early it can reduce costs of repairs. Most commonly used spare parts are carried in stock so we can usually solve urgent problems with little delay. We would be pleased to let you have an estimate should you require our engineers to fit any special parts or accessories to your caravan. Make sure any work done on your caravan is carried out by an 'Approved Workshop'. All caravans should be serviced once a year to ensure safe and trouble free caravanning. Here at North Coast Caravans we are servicing caravans every day to the highest industry standards. In our approved workshop we can service any make of caravan. During the service our main areas of attention are chassis hitch wheels and brakes, body work inspection of seals and moisture checks, gas system for leaks and performance, ventilation, road lights, 12 volt and 240 volt systems, water system. A thorough test encompassing all of the caravan functions, so you can confidently use your caravan on the road and in the field for the coming season. Don't leave home without it.